If your animal or nature friend has a message to share, please send a photo, your friend's words and a short bio to talkingfriends@earthlink.net. Animals have a right to be heard. I expect few people know that I can hear and understand what humans are saying to me. I pick up their vibrations first and then I read them like a book. 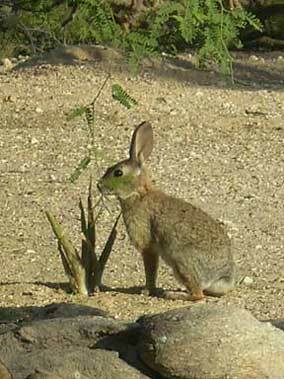 It is really very easy and I can help you and others to understand the way we animals hear and see things intelligently. I must underline "intelligently" here because most people think that we are not able to understand their words and most of all their thoughts! As a matter of fact, this people error is so prevalent on the planet that even my animal brothers and sisters have come to believe it themselves! That's right. They have forgotten that they are intelligent and can hear and understand people. What are we to do? This is a dilemma and one that concerns me most. When people respect us, and stop being afraid of us, there will be peace on earth. Dear Jasper, this is Delphi speaking. How are you? I am fine. Now let's get down to business. 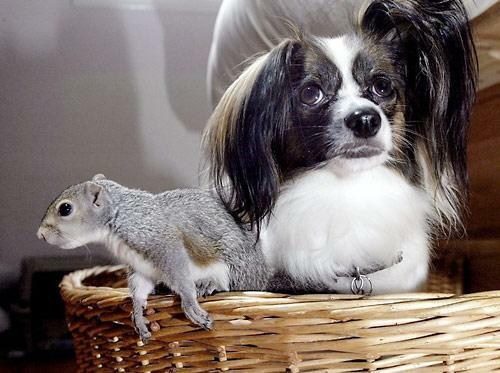 You are right that most animals think that they are dumb. They think that they can't talk as well as humans. Far from it, of course! You and I have to work on this together like a team. Everywhere you go, speak to the animals -- all kinds -- and tell them they must remember who they are now. They can speak and be heard. Tell them that. Because of my books, people are listening much better to animals and they are becoming partners. 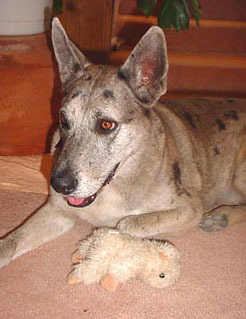 Learn more about Pat and Delphi here. We are the keepers of the Land. That is our responsibility here on earth. My whole body listens. It is like I hear from every cell of my body. I have this way of listening where I can hear in many directions and know the way -- the safe way -- I am to go. We all belong to one another. And we are joined by mother earth. Can we remember this? Realizing that we are one being rooted in the Land, how might we live? What might be our way of living then? 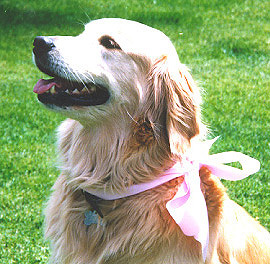 Read more contributions from Copper here and here. Even if someone doesn't like you too much, or even is mean to you, remember to love. Because love is the substance of manifestation. Remember to love. I want to tell people that they have to be kind to one another. Then we won't have problems with animals hurting other animals and people. I think animals hurt when you are unkind, and they get caught in your consciousness. If you want peace on earth, you have to be kind to animals. 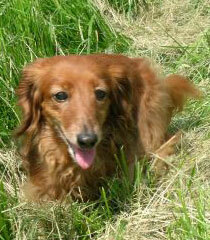 Thank you to Elfie for naming this site! I was having trouble finding a good name that was not already taken, and asked Patricia if she had any suggestions. We were at Elfie's house at the time. Pat turned to Elfie and asked, "What do you think a good name for the web site would be, Elfie?" Then her eyes widened. "You know what he said? 'Talking Friends!'" Thank you, Elfie! We look forward to hearing more from you! 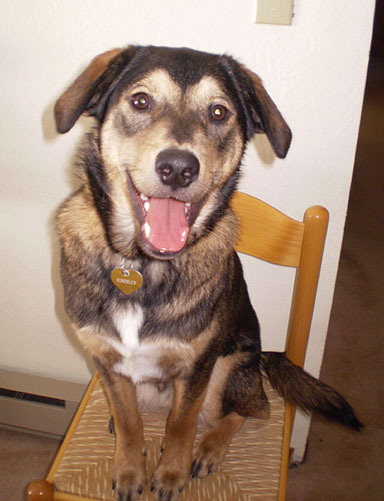 I want to share an experience I had with my dog Linus a few years ago. He is quite the communicator and a very wise being. One day Linus and I were walking with a couple of friends around Wonderland Lake in beautiful Boulder, Colorado. We were all determined to make it around the lake and were very focused. All except Linus. About five minutes into the walk, he refused to move! This was very unusual behavior for him because this is one of his favorite spots to walk! It did look like there was a chance of rain, so I asked the others if maybe we should just go back and they said no. But Linus still refused to budge, despite my continuous pleas to "come," with pulls on the leash to match. Finally I just picked him up and carried him as we trudged on. Ten minutes more into our walk, having not even reached halfway around the lake, we were caught in one of the biggest downpours of drenching cold rain that I have ever experienced in Colorado! There was no shelter to be found, so we had no choice but to continue on for another 20 minutes through the pouring rain to the car! Linus was warning us about what was to happen, but we didn't listen! I was so proud of him for making the effort to communicate his wisdom. He is an amazing friend! Each living thing has a place here -- everything has its own special spot, its particular way of being, right where it is. I might be two feet from a tree, but I am in my own world, my own vibration. Respect every living thing's space. Its space is the area right around it. Walk lightly on my space. There are guardian beings (fairies, sprites, etc.) whose job it is to keep the vibrational field clear. You might bump into some of them unknowingly if you tromp through someone's field (or space) without asking! Take care of your space (or vibrational field). If we would all take care of our own spaces, there would be peace and harmony on the planet. Each "space" would be filled with the love of the Creator! If you would each take care of your own space, there would be no disharmony on the planet. See how we all live in harmony together side by side, as neighbors, each respecting the space of the other. If you (people) would understand this, we could all live in harmony together. We were recently invaded by a colony of small red ants in our living room. After being bitten several times, I decided to vacuum them up -- out of character for me, since I usually carry unwanted guests outside. When I finished vacuuming, I noticed Jasper staring at me with fire in his eyes, appalled by what had just occurred. I asked him what I should have done. "Well, you could have talked to them," he said. "Tell them to stay out." I picked up from him how it felt for the ants to be sucked up by the vacuum, the fear and disorientation, since they hadn't realized they were doing anything wrong (just looking for food). He also shared that their biting was an instinctive defense against "the giant" who kept walking in their path -- they had meant no harm. Then I received the thought from him: "Tell them you won't bother them if they don't bother you." So, I said that to them (the ones that were still behind the wall), and sealed off their entrance with duct tape. I felt a sense of peace, as if somehow this message had been received and agreed upon. When I looked back at Jasper, his body had relaxed. The ants have not returned since. Candace is such a grand little empath, once - upon seeing orphan kittens in a carry cage, she cried and cried and finally I heard her say: "Their cells are crying to my cells, and I must help them." And we opened the cage door and in she went, to nurture and love. When someone asked her about Motherhood, she replied: "It is a nurturing and caring and responsibility. A mother is responsible for life regardless of its form. There are tribes, there have been tribes, who nurture any child in need, not just their own. I am of that Tribe. When there is a need my cells hear the call - every cell in my being responded to their cry for help at a cellular level." 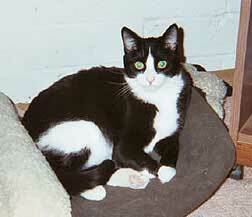 When she first joined us, Candace told us she was Buddha's brother. Did we hear right? "Of course you did. I speak very clearly." Candace figured it must have been rather uncomfortable, the way Buddha sat under that tree for so long, and explained: "I was as the wind around his face, for I was free-form then. And did not Francis call the wind his Brother?" Here is a photograph of Candace with one of the kittens. One day I asked Tiggy about the past. Indicating that she slept behind the washing machine, she said: "Not because I liked it, but because the other dogs expected me to go to my place, as they went to theirs." I explained that I meant before that, when she was locked in the shed. And she said: "There is no reason to remember. That was another's dream. I am on the path of Love and shall not stray." "Talking is good. Listening is better!" During Lorna's first workshop, she was obviously uncomfortable, explaining later that she didn't know "what it would feel like to have people inside me asking questions." Lorna loved springtime and babies: "I saw one the other day, it came out of a box on wheels, but it was a baby alright. A human baby!" I asked if she had a message for this website and she gave me the thought that if we find it too hard to love everyone: "Just love the mothers," with the implication of contemplating all a mother's love represents. "I'm all brand new! The Lightworkers created me!" Lilly loved everyone and everything. For the first year after her transition she simply dissolved into her mother's heart - she returned to the Heart of the Mother. 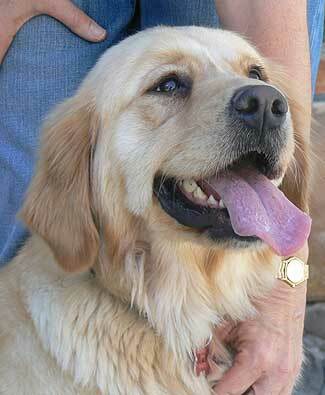 Lilly knows what trauma is and says: "We are very busy helping the others." 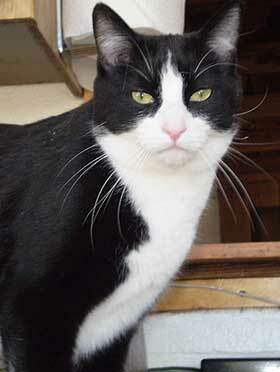 My story is of Chaka, whom I adopted from Best Friends when I started working there 6 1/2 years ago. 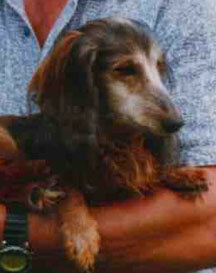 He just passed away in June 2005, and I am still missing him very much. I called a communicator to help me with the euthanasia decision because he was not responding to any arthritis treatments, but was still very alert and present. I just couldn't tell because he was here for me. She confirmed he was in pain and ready to go, but would always be by my side and continue to help me and be a guide for me. In September I had to go to New Orleans and move my mother out of the area until services were restored. She was fine, 83, but the trip was a challenge, leaving in the middle of the night four days after the storm hit. After flying and driving 1200 miles, covering four states in four days, I got off the plane in Las Vegas on my return. I was waiting for a drink at the Starbucks counter when I heard the terminal pager announce "Paging Passenger Chaka, Paging Passenger Chaka." I knew it was my Chaka letting me know he was right there with me. It brought a smile to my face this time, replacing the many tears. I have a special project that I call the PINK RIBBON PROJECT. This project is all about remembering that we are partners in the Circle of Life and that we have a job to do -- each one of us -- in this Circle. What's your job? Write it in your notebook if you know it. You don't want to forget why you are here, you know! When you join my project, you can wear a bright pink ribbon. That ribbon means that you are an important member of the Circle of Life, that you practice the real laws and that you are a friend of Mother Earth. Let me know what you think about all of this. I hope to hear from you soon. Read more about Delphi here. 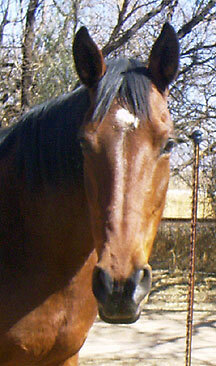 Learn about the Pink Ribbon Project or visit The Sanctuary School for information about Delphi and her programs. I'm part of the family. It's nice to belong somewhere. I can help my family grow. As they know more of my needs, their own thought process expands. Ruby speaks as Spirit Horse as the contribution to the Whole. "We are carriers of the sacred breath released as Power." For more information, please read about the Equine Rite of Passage offered by Community Stepping Stones. Ruby also wants you to reference Delphi: What Being on Earth is All About, Chapter 8, page 85, "The power to be one" (about the importance of horses in helping girls find their power) and Chapter 12, "Partners." "I used to be a tiger. But now I am (in this little body)." that she used to live near. "But I didn't hurt the people. I protected them." I recently attended a conference at the zoo. We spent a lot of time behind the scenes, in areas normally off-limits to the public. As we passed by the rear of the tiger enclosure, we were cautioned to remain an arm's length from the wire fence, but could stop and look if we liked. The two tigers were prowling the perimeters of their territory and passed by us several times, acknowledging our presence while also making it clear that we were close to their space. We all took pictures and enjoyed being close to the tigers. The next day we passed by the enclosure again. Most of the attendees continued on, but several of us remained behind, hoping to get another picture of the tigers, who, as it it turned out, were in the middle and far regions of their exhibit. I was wishing one of them would come to the fence, when suddenly it occurred to me: why don't I just ask one of them to come over? Like you would ask a person? 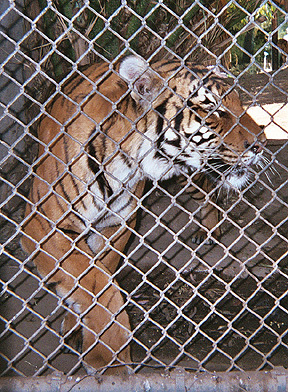 I immediately called out to the tiger who was closest: "Mister Tiger, we would love to take your picture! Would you be willing to come over so we can take your picture?" The other two women took up the chorus: "Please, Mr. Tiger, come over! We would love to take your picture!" The tiger looked our way and paused for a moment, considering our request. Then he ambled over. He came right up to where we were standing and rubbed against the fence in front of us, the same way a cat rubs against your legs when he is happy to see you. We took lots of pictures and thanked him profusely. 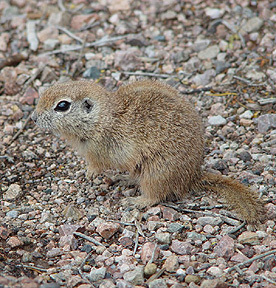 He then walked back to the middle of the exhibit. A few weeks ago my brother observed a flight of swans, about twenty head, and noticed that two of them flew significantly lower and slower, and were obviously disoriented, sick and weak. He observed how the whole flock of swans slowed down: several of them flew toward the struggling stragglers and surrounded them, trying to support and assist them, while the other swans circled and waited. He did not obvserve the weak ones going to the ground. The swans slowly moved out of his sight. 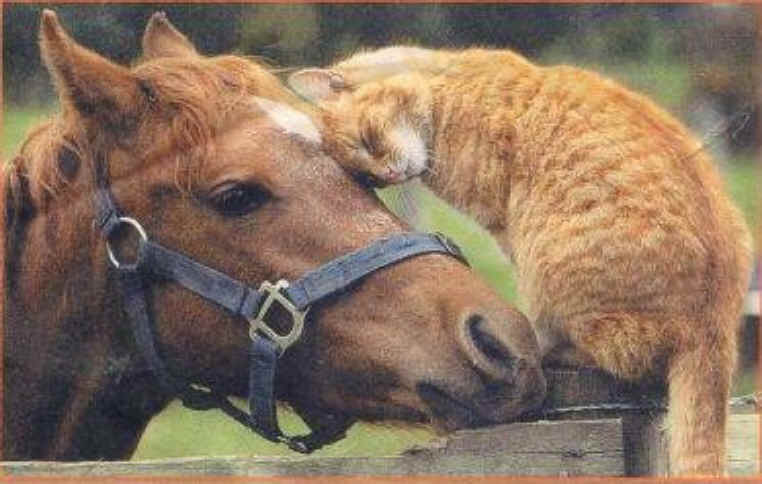 Here certainly is another example of the wonderful compassion and love animals are capable of. You Are So Wonderful to Behold! You can add your own heartfelt words to expand and specify whom you are addressing, but the refrain should remain as above. It suffices just to sing the refrain as a song. You can also sing it to yourself, and to the nature spirits. They love it and feel honored by it! 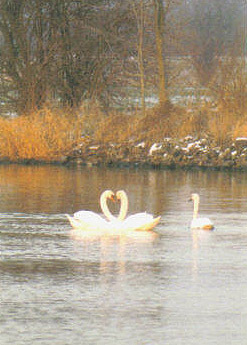 I am including here a photograph I took of wild swans expressing the grace of their love. If you read the front page story of the San Francisco Chronicle on Thursday, December 15, 2005, you would have read about a female humpback whale who had become entangled in a spider web of crab traps and lines. She was weighted down by hundreds of pounds of traps that caused her to struggle to stay afloat. She also had hundreds of yards of line (rope) wrapped around her body, her tail, her torso, a line tugging in her mouth. A fisherman spotted her just east of the Farralone Islands (outside the Golden Gate) and radioed the Marine Mammal Center for help. Within a few hours, the rescue team arrived and determined that she was so badly off, the only way to save her was to dive in and untangle her -- a very dangerous proposition. One slap of the tail could kill a rescuer. They worked for hours with curved knives and eventually freed her. When she was free, the divers say she swam in what seemed like joyous circles. She then came back to each and every diver, one at a time, and nudged them, pushed them gently around. SHE THANKED THEM! Some said it was the most incredibly beautiful experience of their lives. Note: This summary came through a forwarded email; the author's name could not be traced. If you wrote this summary, please contact us and we will gladly give you credit. Last Fall my Medicine Man told me that now Mother Earth and Nature were going to teach harsh lessons globally to promote perspective and wake people up to what really matters, and to promote cooperation and compassion as opposed to competition and exploitation. Sure enough, wherever you look for the past two years or so, natural disasters have increased and weather patterns have changed dramatically. Here in Germany it has gotten to the point where big tornadoes are devastating cities quite unexpectedly, and we never had tornadoes until very recently. The weather forecasts are as frequently right as they are wrong, and it is a mess. Nature is letting us know that she cannot be predicted or controlled. Mankind has tried to control too much of what it should not control, and too little of what we should keep in check.... Now Nature and Earth herself are going to balance the scales, it seems. Of course, Earth has been undergoing major Earth changes cyclically all along; so it could also be that time is ripe for this anyhow. But I tend to believe that reckless human conduct has expedited it greatly. I think it will take a miracle almost to set things right again. But I do believe in miracles. I have witnessed some, and this keeps the candle of hope burning. Let us do all we can, each in the way we know and do best, and trust that it will all work together in a good way . 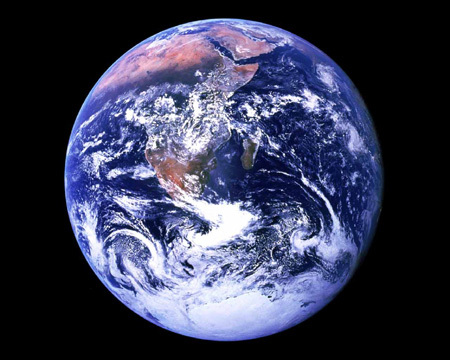 Webmaster's note: If you would like to take part in weekly Earth Healing Meditations on behalf of Mother Earth and her inhabitants, please contact Sananjaleen/June Hughes. 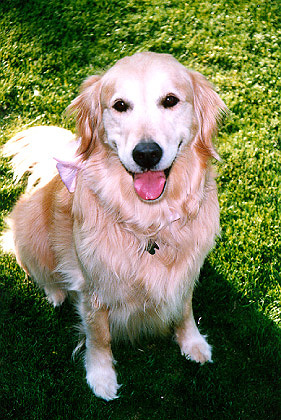 Light is a beloved golden retriever partner and friend who has served at the World Mother Center for many years. 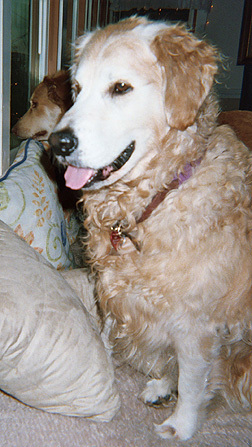 Her code name is Angel Dog and when I first brought Light as a pup to the Virginia retreat center, I was instructed by my inner voice to watch Light. 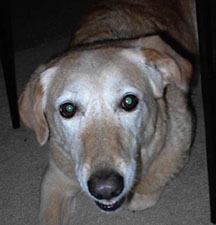 She was different and would teach us about being a dog and angel. Last night at 7 p.m. we held a celebration for Light at the Center. "Unite with the angels! Vibrate with them. Listen to their words. Work with them to heal the earth and all upon her. Listen to them! They are waiting to work with you. You cannot save this planet without them. You must forget yourselves and your small lives, so that the earth can be healed. I want you to do this for me. It is URGENT. If you will meditate with the angels and ask them how you can be of service with them, they will tell you. They will show you how. 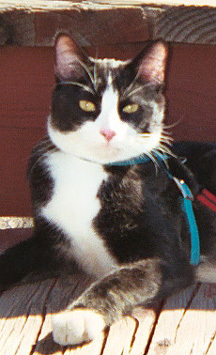 If I hadn't crossed over the Rainbow Bridge, would you have listened to my message? No, you would not. You would have thought I was a cute, furry thing, but my message would have gone unheeded! You must do your duty and forget yourselves! I AM Light." Following her message, I have felt a connection so strong with the angels that I am empowered by them. May you be empowered also, for they are calling. Thank you, Light! Tell them that we (the animals) love them. We want them to be kind to us, because we're their brothers and sisters. We want to help them, and we want them to be happy. Perhaps we could sing some songs or read some books together. This would be a good way for us to get to know each other and be friends, don't you think? 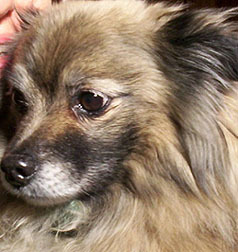 More stories about interspecies partnership can be found at http://lucyandthebee.com and http://www.all-creatures.org. 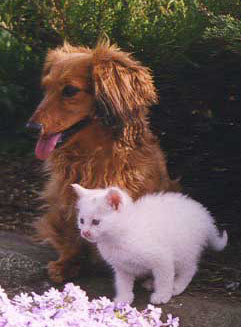 Additional photos of multi-species friendships and interactions can be seen on these pages: 1, 2, 3, 4, 5, 6. 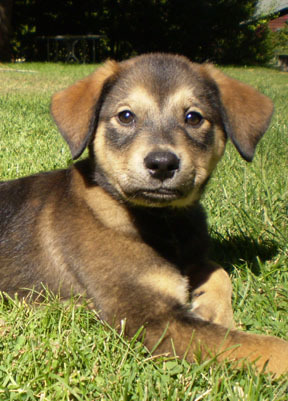 Read here how animals knew in advance to get out of the way of the December 2004 tsunami. A new foal has arrived! In three and a half minutes it came, from start to finish. 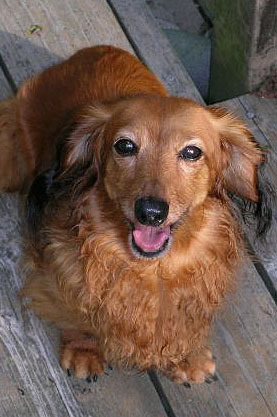 Attended by three (rather unnecessary) people, the Golden, the Corgi, the Jack Russell, a Chihuahua -- and Candace, standing on her kitchen doorstep, gently wagging her tail and sending small welcome woofs. A mother herself, she seemed so pleased and happy. When she saw what was happening out there, she stood to attention, slowly wagged her tail and started these gentle welcome woofs. Not barking -- they were welcome woofs. "All Life should be welcomed. It is a big decision for Life to enter form, and it should be honored." 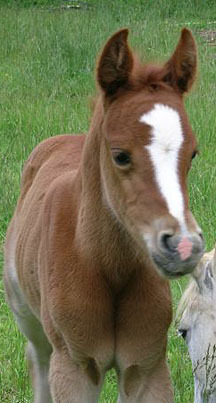 And Little Girl Foal -- what would she say? "She has not yet truly separated her thoughts from the One. She comes from the depths of Oneness into diversity. Give her time. The wild ones, those unrelated to human influence, remain ever in touch with their Source, the One. Those born into human dominion are often overwhelmed, or at least affected by and must adjust to or merge with their family unit on earth. In other words, their thoughts and behavior reflect, in part, their surroundings, and she needs time to explore this reality." 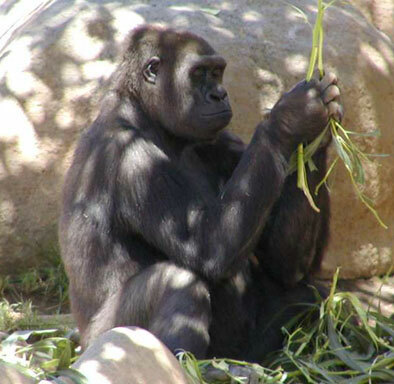 Great News for Apes in Spain! Read here about how the Spanish Parliament is considering granting freedom and the right to life to Great Apes. This is the first time a national legislature has considered granting such rights to non-humans, and, if passed, sets the precedent for similar rights to be extended to other animals. 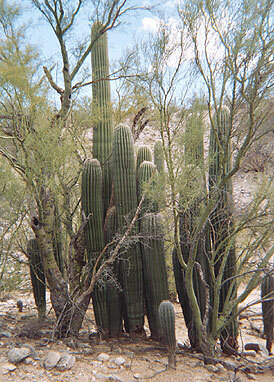 Saguaros (with elementals?) in the desert. "Look around you. What do you see?" "A lot of different people: plant people; bug people; rock people; stone people. Right now there are a lot of bug people flying around me." "Now look with the eyes of Spirit. What do you see?" 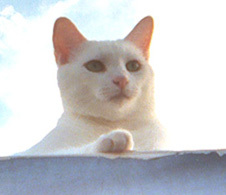 (I suddenly became aware of small whitish forms densely surrounding all the living things around me). "All sorts of little elementals; fairies, nature beings -- whose job it is to care for the plants." "Correct. Behind every living thing there is an element -- a spiritual presence -- that maintains and sustains it. If you could see yourself, you would see that you are surrounded by angels -- angelic components that assist you in staying strong and whole, so that you can perform your mission on earth. It is their job to see to it that you are successful -- able to do what you are here to do -- just as it is the fairies' job to sustain the plants -- to help them stay healthy and strong, to do what they are here to do. You are never alone: no thing in creation is without alliance and help on the spiritual level, on many levels at once, simultaneously. You must remember this. You are never without help, without the assistance you need to accomplish the work you are to do. But you must remember this and ACKNOWLEDGE it. Say 'thank you,' as Delphi says, for the help you are continuously receiving on the seen and unseen levels. 'Thank you' opens the door to the creative substance all around you (that flows to you) -- it allows all the forces of the universe to go to work on your behalf. And because you are engaging all the forces of the universe, you are never alone, surrounded and supported by the universal Life Essence from which all things are made. Remember this, and your connection to all living beings. And give thanks." "Thank you. What more can I do to assist with this connection?" "Just remember and say 'thank you.' 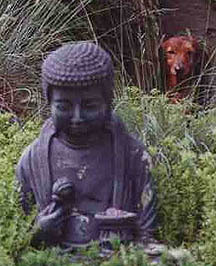 And talk to the elementals, the angels and caretakers of the plants and flowers and animals in your care." "We all need to shift position to the goals we've made and not fool around with lesser stuff, including myself (a possible reference to her interest in food). I want to stay right on my purpose. 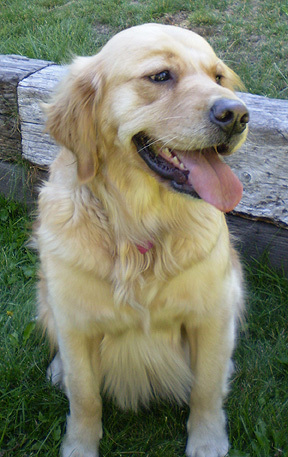 A Golden Retriever named Delphi helps me to teach classes on Animal Communication. I have been very fortunate to be gifted with the knowledge and the ability to communicate telepathically with all the kingdoms of nature and because of this, I am able to understand Delphi. Delphi has always, as long as it has been my pleasure to know her, made it clear that she has a mission. And if she wasn't about the business of her mission, she was not happy. When I first became aware of Delphi's dedication I asked her what her mission was. She answered right away with the words, "Dogs can speak." 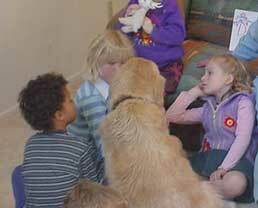 Her mission has grown as her participation in the classes have clearly shown that not only do dogs speak but they understand deeply the thoughts and feelings of others. I have -- as others have -- been truly amazed at the healings of the heart that have resulted in Delphi's active presence at the classes. She has broken open many a heart and brushed away many a tear! Delphi says to all of us that there's another place, a world of love and cooperation, where we can all work together to help the earth. 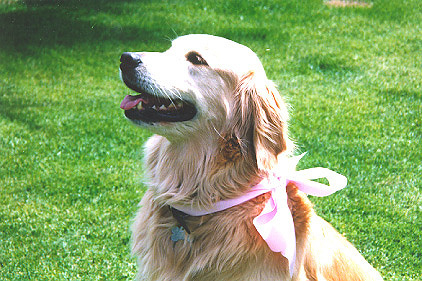 "Wear a pink ribbon if you believe me and want to become a member of my club," Delphi says. I wonder...just wonder what kind of world we would have if we knew, like Delphi does, that dogs could speak? What would happen if every living creature had a vote? Learn more about Delphi and her books, Six Lessons with Delphi: How to Live Happily with All Life and Delphi: What Being on Earth is All About at http://www.patriciajepsen.com. "I am on friendly terms with myself." I wondered how many of us could really say that! Soooo much wisdom when we can listen!!!! I felt the peaceful waters ruffled and disturbed last night and sat in prayer and meditation at midnight. Ahhh...then I felt the presence of angels...many angels. "No. Ghosts wear their own clothes." Sheba: "I used to be a tiger, but now I am a cat." Susan: "It must be hard to be a cat when you're used to being a tiger." Sheba: "Not hard -- just different. But I know I am here for a reason. I know my purpose. 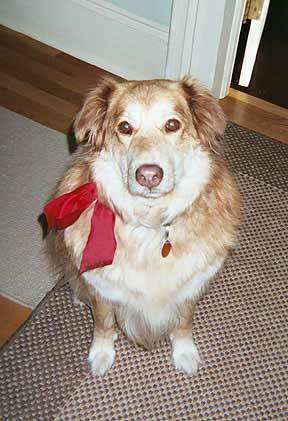 Over the Christmas/New Year's holiday, I spent time with Delphi, Copper and Pat in Port Townsend, Washington. 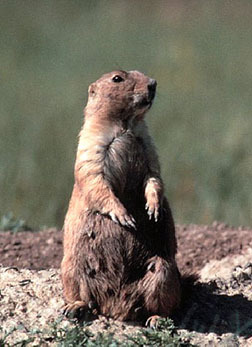 One day, Copper overheard me telling a story about some javelinas. He did not like the story, and asked me to tell a different story. 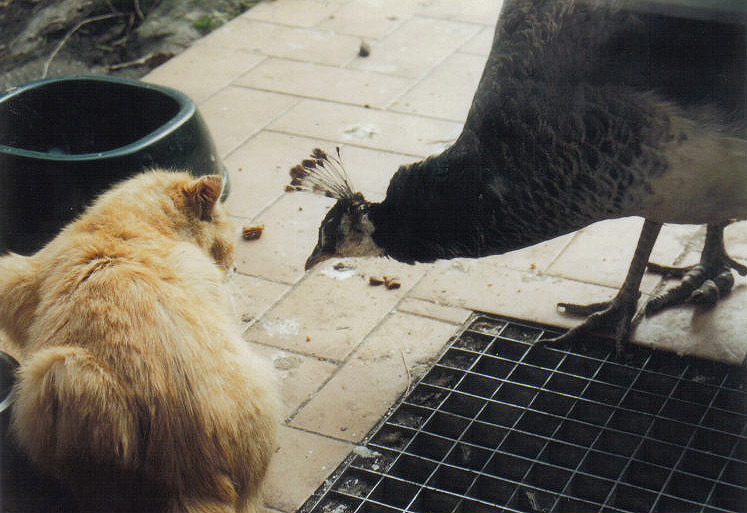 I told a couple of stories about my animal friends, but neither of these were to his liking, either. So I asked him: "Copper, perhaps you could tell me some of your stories. What stories should I tell?" His immediate reply: "Tell the story about how the ivy (hanging in a pot) is friends with the plants on the ground next to it; and how those plants are friends with the plants next to them; and how they are friends with the plants next to them" (continuing in a circle around the yard). He called it a "RING OF FRIENDSHIP." 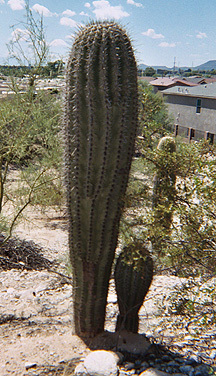 When I shared this with Pat, she said, "That is why it is so important to be careful when you are pruning the plants; you could cut their connections to each other." Copper then told Pat about Zone Man, a large being that stands in the middle of the yard, overseeing all the plants. Copper said that he is Zone Man's helper, but "I have many jobs. ZoneMan has only one job" (to oversee the plants). Copper has been waiting to write his book, Power to the Plants. It looks like he has already begun. Thank you, Copper!! Power to the plants, and to those who like plants! I speak for the plants because they don't have a voice. Everybody says that plants don't have a voice, but they do. Everyone has a voice. Copper: "If you listen to the land, there would be no trouble on earth. The land tells us everything we need to know. Then we can hear what the earth is telling us. There will be a new world altogether for us here." Delphi: "That's the Circle Teaching." 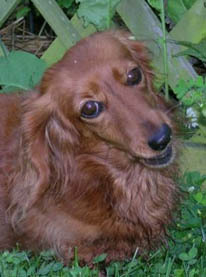 Copper is the author of Listen to the Land , as told to Patricia Jepsen. I would like to share a story about my cat friend Sheba. 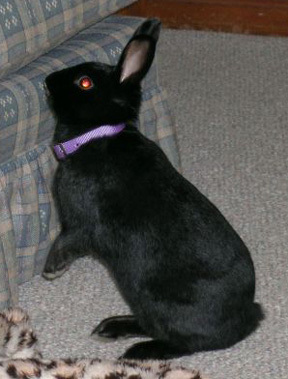 When Sheba first came to live with us, I assumed that she would be a loving and playful companion. I considered many names for her such as Felicity, Celeste, Faith, Hope. 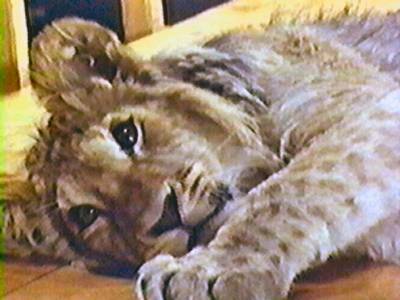 But one day in meditation, the name "SHEBA" came roaring through, with the awareness that this kitten saw herself not as a cat, but as a LIONESS. So, Sheba she was. A short time later, Patricia Jepsen wrote in Sheba's pet chart: "What you see presently is a little kitten, but don't let that fool you. She has a very large energy field through which she will project herself and guard you....Sheba will serve as your psychic guard for the duration of her stay with you." 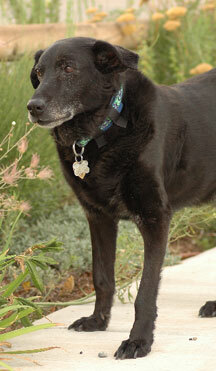 Since that time, I have had many opportunities to witness Sheba's skills of protection and support. But the most amazing example of her abilities occurred the other night. I had somehow come into a negative energy field, that is to say, I could feel a negative "presence" around me. Despite my best prayers, affirmations, calling on the Christ and His angels, rebuking in the Spirit, this energy would not leave. As I prepared for sleep that night, I said a prayer of protection; I did not want to enter the sleep state with this energy around. I shut my eyes warily. In the middle of the night, I awoke to find Sheba lying against my legs (a rare event). In my half-awake state, it occurred to me that perhaps she could assist with the situation of the energy field -- after all, wasn't that her job? No sooner had I thought this, when I saw (in my mind's eye) a giant paw reach up, claws extended, and drag itself down effortlessly through the energy field, shredding it. It vanished instantly. I fell back into a peaceful sleep. I will never again doubt the abilities of my friend Sheba. She is an amazing cat! One of the participants at a recent workshop shared that in a meditation she had received a decree -- out of the blue. She wondered if it really came from her Inner Voice and God's Intent. I dismissed her question and continued with the class. 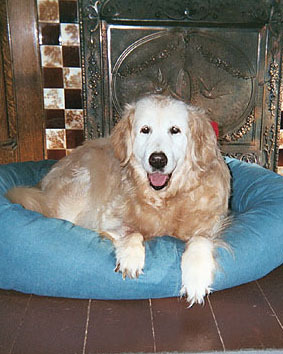 However, golden retriever Delphi, who had been sound asleep across the room from me, coughed and rose to her feet. She walked straight over to me and waited. "The Creator does not mince words. The Creator knows what He wants and He says what He wants right through your heart." Having said what she said, she turned and walked behind my chair where she plopped down and was quiet once again. This is the magic of the Circle. "Help us! You must help us! Something is terribly wrong. All of the creatures that live under the earth can feel it, but we don't know what to do." I sensed from him that the ley lines or energy grid under the earth was dangerously out of alignment, and that the animals who lived underground were alarmed. They did not understand what was happening and did not know what to do. He had come from "down under" to ask for help. The situation was of a grave magnitude, much more than one person could handle; but I told him I would do the best I could to make a difference. He seemed relieved to have been heard, as if he had done his job by alerting a human to the situation. He then went on his way. I share this with you as a way of passing on his message: the earth is in crisis. Please do what you can to make the earth a greener, cleaner, more peaceful and beautiful place. Our mutual well-being depends on it. She is in the midst of rising right now, and those who are conscious of her rising and transformation hear her cries from her heart center. The world is not ready for her to rise. We know that. However, we have held back too long and it is time. Just as a mother giving birth, Mother Earth must bear her child that is the new creative dimension. Animals are closest to Mother Earth. They lay upon her, their paws feel her words as vibrations and their instincts tell them when she will rumble, storm or fill the land with water or fire. They are feeling her now and they are troubled. They want to help, but they do not know how. They need your understanding of what is occurring, and you can give that to them through personal contact and communication and/or through the angelic kingdom. Let them know that all is well -- that the earth is changing and that you are changing. 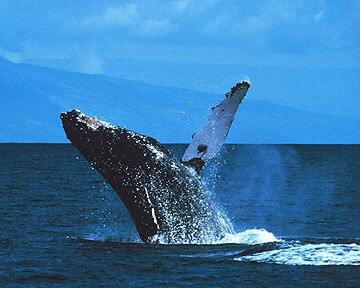 Many animals and "people of the sea" do not know this and are worried and anxious. Keep your thoughts high and your vibrations clear so that they can feel your assurance. This is cosmic change on a grand scale and they know it! 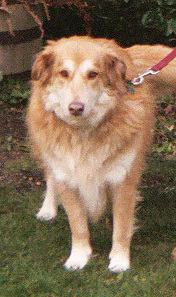 Here is a message just received by my angelic friend and partner, a golden retriever/husky mix named Copper: "Those animals who are not ready to transcend will pass away from this earth. The others who are ready will continue their work here and become angelic beings serving Earth Mother." The weather had turned cold, and I awoke with the thought that I must feed the birds. I hadn't put out any seed for several days. On my way out the door, I poured some seed into a nearby feeder, then filled a dish on the other side of the yard. 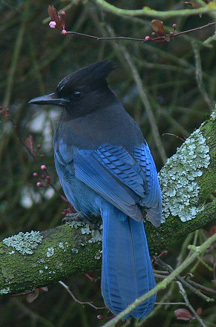 I glanced back at the first feeder to see a Steller's Jay already busily eating. "My goodness," I thought, "those birds are quick to notice the seed!" Immediately came the response: "Whose idea do you think it was for you to put out the seed, anyway?" 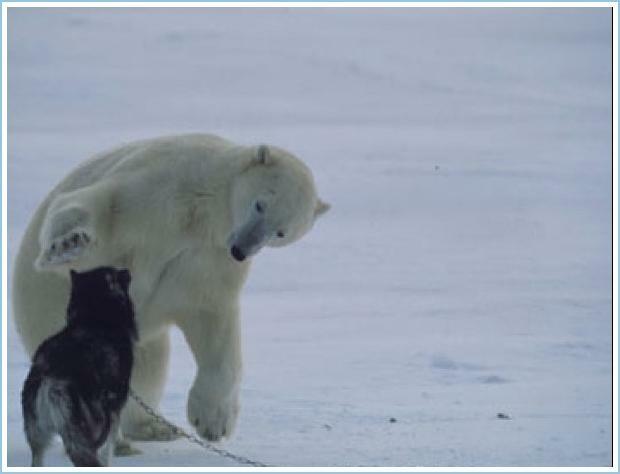 View an audio slide show of a polar bear playing with a sled dog in a spontaneous moment of joy. Photos by Norbert Rosing, audio recording by Stuart Brown, as recorded on Speaking of Faith (American Public Media radio program). A friend and I were discussing a dog friend who was having a health crisis. Could this be her time of transition? 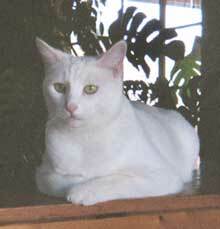 I glanced over at Jasper, who was sitting nearby and watching us intently, his eyes ablaze. "Jasper -- do you have something to say?" I asked. Jasper: "When it's a dog's time to go, they know." My friend responded: "What about cats?" 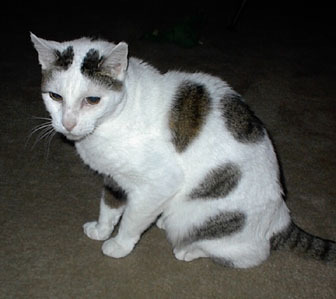 Jasper: "When it's a cat's time to go, they know. You don't need to try and interfere or figure it out. "We (animals) know much more than you give us credit for. We know a lot of things. We know how to listen (to the Earth, the Mother), and she tells us things. That's why we know these things, because we listen. "Why can't you listen, too? "You only need to listen." Once you release your thoughts of death and disease, the animals will not suffer. But your thoughts are binding them in a world that does not know. You must release for their sake your attachment to the lower worlds of confusion and death. You must give them the opportunity to live in joy without affliction and to complete their journey as angels should; and so be gifted with new life in the causal planes of existence. Knowing that you may be the cause of the affliction, turn not to shame but rather to the intelligence of the Divine Light and move forward without death and disease in your consciousness. If you can do this, your Thought Adjuster will help you. The beautiful beings, who have been your friends, companions and protectors—and yes, even teachers—will suffer no pain. When man releases his old self and comes into his New Self, all life will be abundant and we will all rejoice together in the name of our Lord. Let this Christ Message go forth so that all might hear it and release these precious ones into a life and light that is their right. Is this not incentive enough to go forward into the Light as I AM? Now in this moment of Truth, let us all together as a unit let go disease— the belief in this—and go forward without shame into the completeness of our being, the perfection of God’s Body, as the solar level of consciousness where there is no death. Now, if in human consciousness, there is no place for death or disease, then that which has been a human thought form dissolves for lack of belief. Are you willing to conceive of truth? From this day forth give no thought other than to the perfection of being. 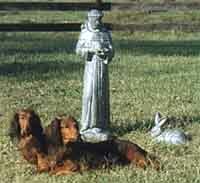 This way shall you contribute to this earth and to all God’s creatures, who have been servants of the Lord. Heal them by healing yourself. Listen to the Voice within “Dissolve the death program”! The purpose of my incarnation is to spread joy to others. I don't think, I be. There's a lot to be happy about! My best days are ahead of me. 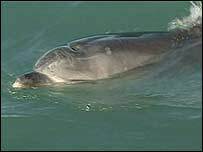 Read how a dolphin in New Zealand rescued two beached whales. 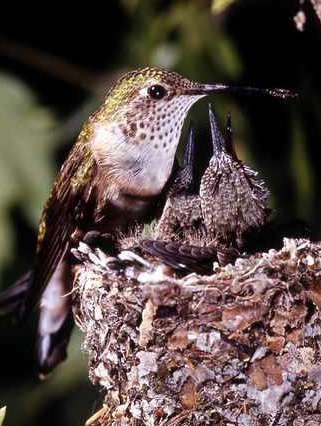 Click here to read the story of a hummingbird healed by sacred dance. When heaviness comes upon you, think of the Son of God within you, and you will go all golden! Give your burdens to God. I'm the dog that's going to help people that can't help themselves. This amazing no-kill, free roam cat sanctuary houses over 500 cats and many dogs, who all live peacefully together while awaiting adoption. Too see a video about this special place, visit http://uk.youtube.com/watch?v=vwM6f0liHpo . 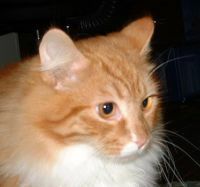 You can also visit their website at www.cathouseonthekings.com . 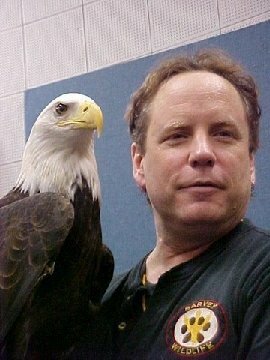 Freedom is a rescued bald eagle; Jeff Guidry is his handler at the Sarvey Wildlife Center in Arlington, Washington. Read the story of their special relationship and of how they helped to heal one another here. There is also an email by Jeff profiling their life together here. Let's do what we always do: let's pray and say "thank you" and it will be all right. Everything is so easy when we don't figure it. You must have confidence in the Creator. I am a good dog! 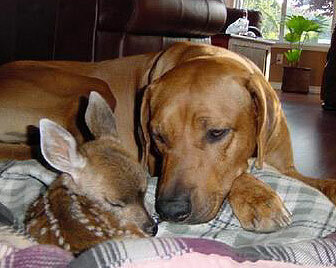 Click here to view a touching video of a fawn and kitten. I'm never without kisses for the ones I love! Question: "Where did you come from, Kingsley?" Kingsley: "We all come from the same place." I like to meditate; it solves all my problems. View this touching video of an adult male lion being reunited with his former owners after a year of living in the wild. Learn more about Christian here, or by clicking on his photo to the left. 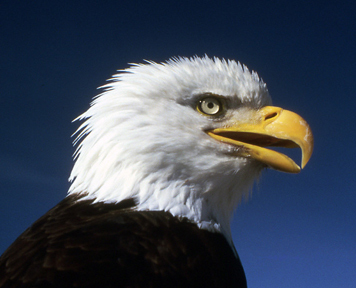 Watch as an "Eagle Whisperer" frees a bald eagle ensnared in a rope. Baloo the Bear, Leo the Lion and Shere Khan the Tiger have an unusually strong bond. 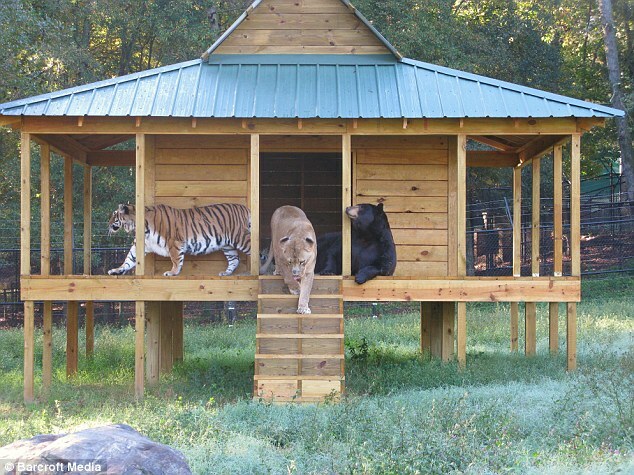 Raised together as cubs, they share an enclosure at Noah's Ark Animal Rescue Center in Georgia. Read their story here! Watch videos of them here and here. 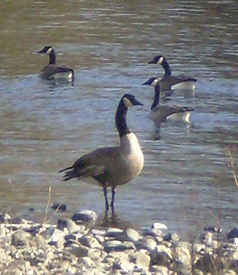 Read this touching story about a dog, a woman and 15 geese, who went for a swim/walk together! myself during a day stint on the Appalachian Trail. A female deer walked in front of me on the trail. She kept looking around and watching me, and then kept on leading the way. 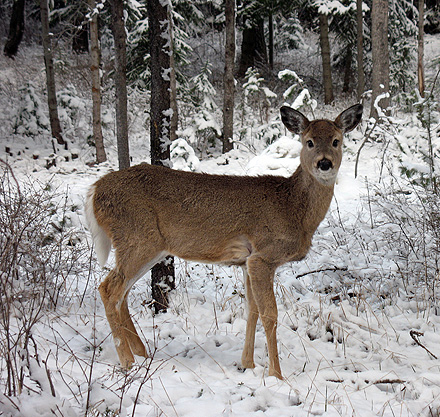 I began to gently sing a spirit song to honor the deer. She stopped, made a half turn toward me and looked at me with pointed ears and soft brown eyes. She let me come a lot closer and then continued to lead the way for quite a while longer. It was so "endeering"!!!! 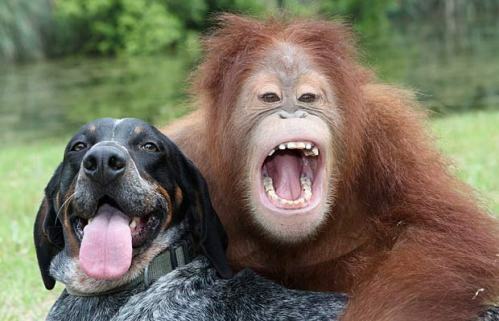 An orangutan and a hound become fast friends. 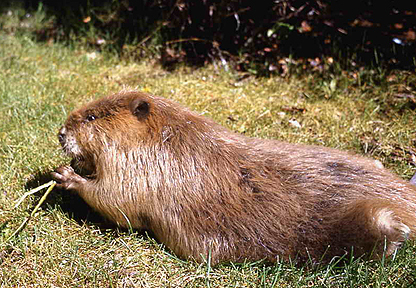 Read this beautiful story of an encounter with a wild beaver.